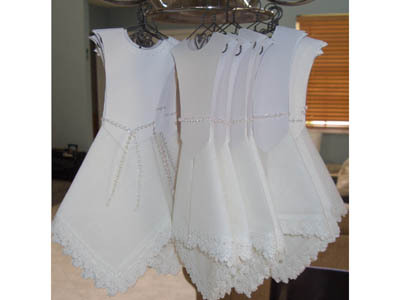 Virginia from California took our wedding dress template and our line of lace edge wedding handkerchiefs and created her own unique wedding dress hankie wedding favors for her bridal party. We just love how she used crystal beads along the neckline of the bodice to complement the matching crystal beaded belt tied around the waist. Thank you Virginia for sharing such a wonderful variation on the wedding dress hankie favor!